Let’s set the scene here. It’s fall, so the leaves are changing and there’s a crisp bite to the air. You’re in the woods, sitting on the front porch of a log cabin. Maybe you’re wearing a flannel. Maybe there’s a hunting dog by your feet. You can smell the fire from the fireplace inside the cabin, and you’ve got a cocktail in your hand. Something whiskey based. And after this cocktail, you’re gonna grab a good book and have another cocktail. Maybe you’ll chop some wood later. Or maybe go for an easy hike. The details don’t really matter; what matters is that you’re spending the day outside and you have a cocktail in your hand. Tattersall Distilling understands this scene as well as anyone. The Minnesota-based distillery makes a wide variety of spirits, from a Monongahela-style rye to a grapefruit crema, and has their own bar where they serve classics alongside new cocktails developed in house, using their own spirits whenever possible. 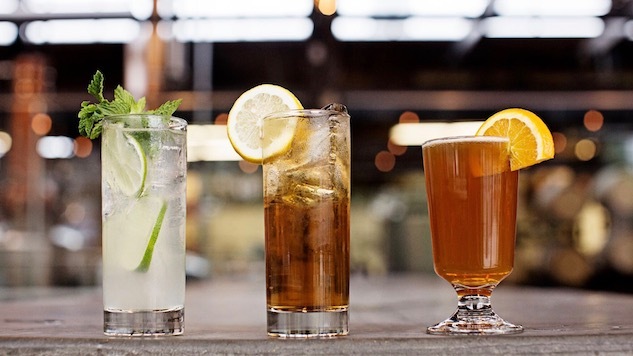 This summer, Tattersall introduced a new cocktail program called “Cabin Cocktails,” which is full of fun and easy cocktails meant to be enjoyed outdoors. It’s a cool concept, but I think it’s even more appropriate for fall, because that’s when I really want to disappear into the woods with a thermos full of booze. So, we pulled a handful of Tattersall’s cocktails together to create a fall edition of their Cabin Cocktail program. As for the booze that Tattersall produces in house, take your pick. A lot of their bottles are made specifically for mixing, but their rye is well aged and tasty and their barrel-aged gin is floral and totally sippable over ice. They distill everything in house and even go so far as to source as many ingredients from regional Midwest farmers as possible. The corn, wheat, barley and rye are all growin on a family farm in Minnesota, as is the fruit whenever possible. Even the barrels they use are made at local cooperages. You gotta respect the attention to detail, particularly when you consider the sheer variety of spirits that Tattersall makes. So we used mostly Tattersall spirits in the cocktails you’ll find on this list, all of which pair perfectly with changing leaves and flannel shirts. Directions: Combine and serve over ice in a lowball or coffee mug. Directions: Combine ingredients in a pint glass and garnish with an orange wheel. You can use a Big Beer Lager if that’s all you have, but we like the complexity of Western Standard, particularly in the fall. Directions: Combine ingredients in a mug and stir. Serve warm. Directions: Combine all ingredients in a Collins or pint glass.